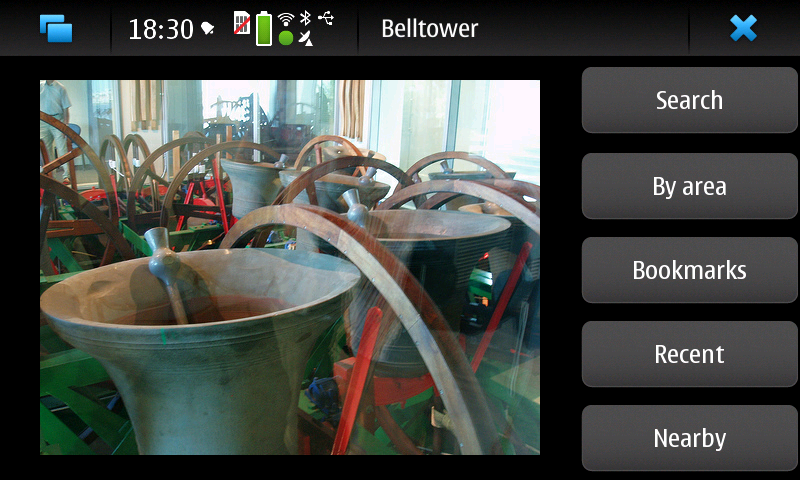 Belltower is an application for the Nokia N900 to find belltowers hung for English change ringing. The program is in an early stage of development. It is available from the maemo-extras repository. The data is taken from Dove's Guide for Church Bell Ringers . List all towers within fifty miles of you, using the N900's built-in GPS. Search by name or by area. Bookmark towers to return to them later. Get help in the forums. View the details of the project's source code. More information will be shown about each tower. Full county names will be displayed rather than abbreviations. The system will be able to download the latest version of Dove's Guide automatically. Tenor notes will be shown using ♯ and ♭ rather than # and b. You will be able to choose to sort towers by name, distance, or time until practice night. You will be able to choose between imperial or metric for tenor weights and distances to towers. The picture of a belfry is copyright © Amanda Slater, cc-by-sa.